A huge portrait of Imelda hangs like a mini shrine over her shoe collection at the Marikina City Footwear Museum. Madame donated 749 pairs of shoes to the Museum. What do these Shoes actually symbolize? 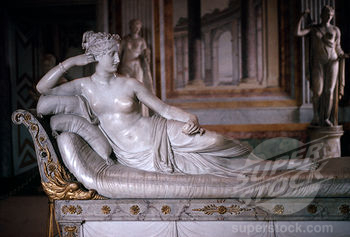 Avarice? Wretched excess? Transcendent vulgarity? Uh-uh! These shoes epitomize Truth, Beauty, and Freedom. "I did not have three thousand pairs of shoes, I had one thousand and sixty." There you go. It was not 3,000 or 2,700 as some reports have it but 1,060. So it would only take Madame less than a year to use all these shoes if she uses at least 3 pairs per day - not 2.5 years as some accounts related. President Marcos even defended the First Lady's collection by emphasizing that it took her 20 years! 20 years to amass these 3,000 pairs. Much ado about nothing. "They went into my closets looking for skeletons, but thank God, all they found were shoes, beautiful shoes," Madame smilingly told reporters. "More than anything, the museum will symbolize the spirit and culture of the Filipino people." Did Madame mean our dystopian tendency? 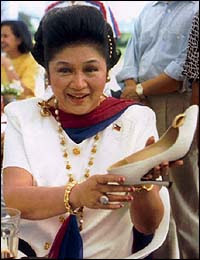 I cannot obliterate the image of 3,000 pairs of shoes trampling over the Filipino people. Lance Morrow's essay on the topic elucidated that the purpose of having riches is "to buy freedom - to purchase choices, immunities from the will of others, or of fate." 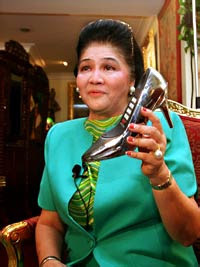 For Imelda, it was not a question of using these shoes per se. Rather, it was the knowledge that these shoes gave her options. "What's wrong with shoes? I collected them because it was like a symbol of thanksgiving and love?" 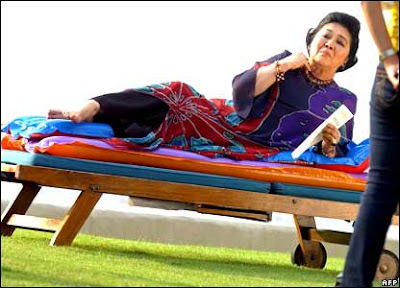 At the end of the day, our preoccupation with Madame's shoes is but a smear campaign that tried but failed to undermine the good, the beautiful and the real that is Madame. "Much ado about nothing, really." "Bakit mayroong mga Pilipino na naninira kay Presidente at kay First Lady? Hindi ba nila alam na kami ang Tatay at Nanay ng Bayang Pilipino? Kung kamote ang Tatay at kung kamote ang Nanay, kamote ang Pilipino! Ang kamote ay hindi nag-aanak ng kamatis."